Summer heat may affect your appetite, which for most people may be desirable. But if you're underweight, this can be worrisome. Finding ways to gain weight in the summer requires attention to not only food choices but temperature as well. Consult your doctor or dietitian for help designing a weight-gain meal plan that fits your specific needs. When you don't feel like eating, you may have a harder time acquiring the extra calories necessary to gain weight during the summer. In order to add 1/2 to 1 pound a week to your current body weight, you need to eat 250 calories to 500 calories more than you burn in a day. According to the McKinley Health Center, however, when you're struggling to put on weight due to genetics or an increase in activity, you may find that you need to eat even more calories to gain the weight you desire. Your calorie target depends on a few factors, including your body size and genetics, and an online calculator or nutrition professional can help you pick an appropriate calorie goal. Drinking your calories is one way to up your intake for weight gain. Those liquid calories may also help you cool down and stay hydrated when it's hot outside. For example, drink an 8-ounce glass of 100-percent fruit juice for an extra 120 to 180 calories. A refreshing fruit smoothie carries plenty of caloric heft; add yogurt or soy milk for a little protein. 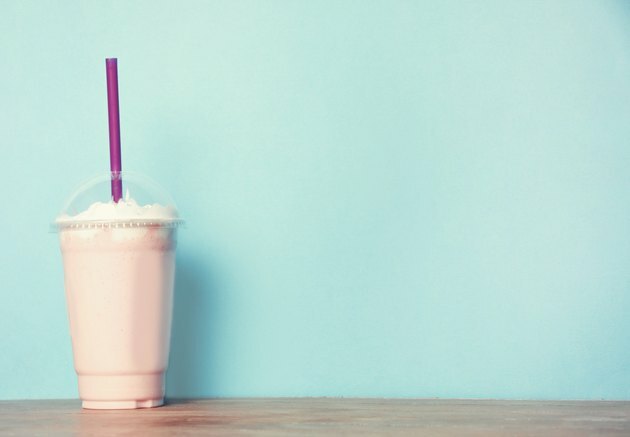 A milkshake fits the bill for a refreshing high-calorie summer drink that helps pack on the pounds. Blend 1/2 cup of ice cream with 1 cup of whole milk and 2 tablespoons of peanut butter for a sweet 600-calorie treat. Foods you already eat can contribute more calories if you supplement them with calorie-dense foods, which offer a high number of calories in a relatively small portion size. These foods add calories without bulk, and may not have much impact on appetite, so you can gain weight without feeling too full. Nonfat dried milk powder, for example, has 27 calories per tablespoon and can be added to yogurt, pudding, milkshakes, smoothies and to the milk you drink. You can also mix the powder in soup, mashed potatoes, macaroni and cheese and pancake batter. With 40 calories per teaspoon, vegetable oils, such as olive, soy or safflower oil, also make good calorie boosters for summer weight gain. Use the oil when cooking vegetables and meat, or toss it with your salad and grain dishes. Eat nuts or nut butters as a snack; they average 90 to 100 calories per tablespoon. Summer is the season of fruits and veggies such as peaches, watermelon, berries, sugar snap peas, tomatoes and eggplant. While you should fill your diet with these nutrient-rich but lower-calorie foods, you want to add high-calorie foods when you're trying to gain weight. For example, you might make a summer grain salad mixing high-calorie quinoa, which has 222 calories per cup, with sliced grape tomatoes, red onion and peas. Or top your yogurt with seasonal fresh raspberries and a handful of walnuts for a little calorie boost. Other high-calorie additions to your summer produce favorites can include eggs, cheese, nut butter, avocados, hummus and dried fruit.